One of the regional desserts from this area is something called zuppa Inglese, which is a little bit like a trifle. 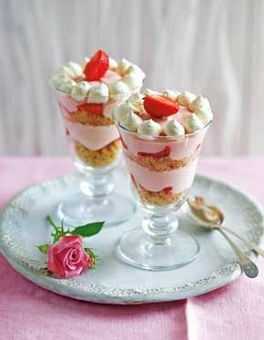 This leads me perfectly to this week’s book, Layered Desserts by MasterChef finalist, Hannah Miles. It contains classics like knickerbocker glories along with international flavours such as Jamaican rum mille-feuille. Try my choices with some fresh end of season berries. Enjoy! Begin by preparing the crème pâtissière as it needs to cool before you assemble the trifle. Whisk together the eggs, egg yolks, cornflour, vanilla and caster sugar. Heat the cream and milk together in a saucepan and bring to the boil then pour over the egg mixture, whisking all the time. If you do not have a stand mixer, get someone to help pour the milk mixture while you whisk. Return the mixture to the saucepan and simmer over a gentle heat, whisking all the time until the custard thickens, then immediately pour into a bowl. If you leave it in the pan it will continue to cook and may scramble. If your mixture does start to scramble, quickly pour it into a fine-mesh sieve and whisk hard in the sieve so that it passes into a bowl below – the scrambled parts will recombine with the custard. Leave to cool. Next prepare the compote. Heat half of the raspberries and half of the blueberries in a saucepan with the caster sugar and 2 tbsp of water then simmer for about 5 minutes until the fruit is soft and the juice is syrupy. Leave to cool. To assemble, cut the Swiss roll into thick slices and place over the base and lower sides of the dish. Drizzle over the sherry and then spoon over the fruit compote. Top with the remaining fresh berries and then pour over the cooled custard. Whip the cream to soft peaks in a bowl and spoon over the top of the trifle. Chill in the fridge for about 3 hours. To serve, you can top with more berries if you wish. The trifle will keep for up to 3 days in the refrigerator. Soak the gelatine leaves in cold water until soft. This will take about 5 minutes. Place the strawberries, caster sugar, vanilla, lemon juice and lemon zest in a saucepan with 100ml of water and heat for about 5 minutes until the strawberries are very soft. Pass the mixture through a sieve, pressing down on the strawberries firmly with the back of a spoon so that they become a fruit purée. Discard any strawberries remaining in the sieve. Squeeze the water out of the gelatine leaves and add to the warm strawberry syrup. Stir until dissolved, then pass through the sieve again to remove any undissolved gelatine pieces. Leave to cool. Whisk the double cream and cream cheese together and then whisk in the strawberry syrup. Blitz the shortcake biscuits to fine crumbs. Melt the butter and then stir into the crumbs to ensure they are all coated.